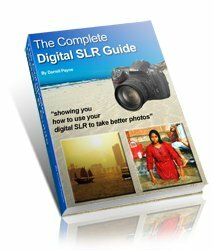 Here you will find tips, tricks and good all-round advice for your digital wedding photography. I've shot a fair few weddings in my time and been up until the early hours editing the results with Photoshop. Weddings are, quite possibly, the biggest day in the life of the happy couple (I absolutely loved mine!). And being asked to photograph someone's wedding is both a great honour, and possibly a curse! The bride and groom will naturally want some good photographs of their special day. Both for their own memories, and also so they have something to bore their friends and relatives with afterwards! The photographer's job is therefore quite important. You can't ask for a re-run if you miss a special shot . . . "sorry, I missed that. Could you take the rings off and do it again"
. . . is not a phrase anyone wants to hear at their wedding! Digital wedding photography tip#1 - don't panic! How do I get there? What should I take with me? What if I run out of . . . ? Don't panic! The tips and tricks on these pages will help see you through. First, you can easily rattle off hundreds of photos and not have to worry about loading more film every five minutes (although this is not a tip, and don't think this is how the pros get results - it isn't!). A big plus point for digital wedding photography. Second, and probably more significant, you can see the results instantly. And a good tip is to check important shots, but not every shot. Did Auntie Jean just sneeze? No problem! Check the shot, if she did, quickly take another one (and perhaps move Auntie Jean away from the flowers!). Another big plus for digital wedding photography! So, compared to traditional wedding photography, digital wedding photography is far more forgiving. On these pages you will find lots of help, advice, tips and tricks to make your job a little easier. As the photographer you have to approach the wedding with a certain level of professionalism, no matter how friendly you are with the bride and groom. But don't panic, it's all completely do-able. If I can do it, then so can you! free web-hosting . . .
Fortunately help is available and I can honestly say that none of this is impossible to learn. There's a fabulous downloadable digital wedding photography toolkit that includes all the help and advice you could ever want - and as the toolkit gets updated you get to download the latest version for free. It means you can always be up to date! It's not really relevant to you if you're photographing a wedding as a favour. But if you are considering making some money from your wedding photography (or just investigating the possibility) then it's your indispensible guide. I would recommend you start by having a look at the general digital wedding photography planning advice covered in the wedding photography checklist pages. This covers important steps to take before you even get to the wedding. There's also a downloadable wedding photography checklist for you. You may well be wondering whether your camera is up to the task of digital wedding photography? 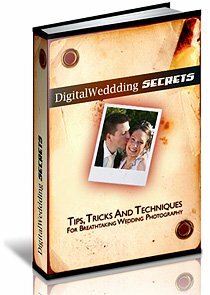 Have a look at the sort of digital wedding photography kit you will need to find out if there's anything you might want to buy. Then have a look at the tips on actually taking photos of the happy couple. Things like how to pose them, lighting and so on are covered. 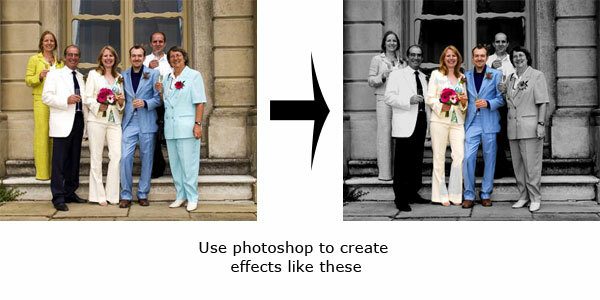 Finally, have a look at the Photoshop tips and tricks for editing wedding photography section. As good as your photography might be straight out of the camera, there's always more that can be done in Photoshop to make a good photograph a great one!